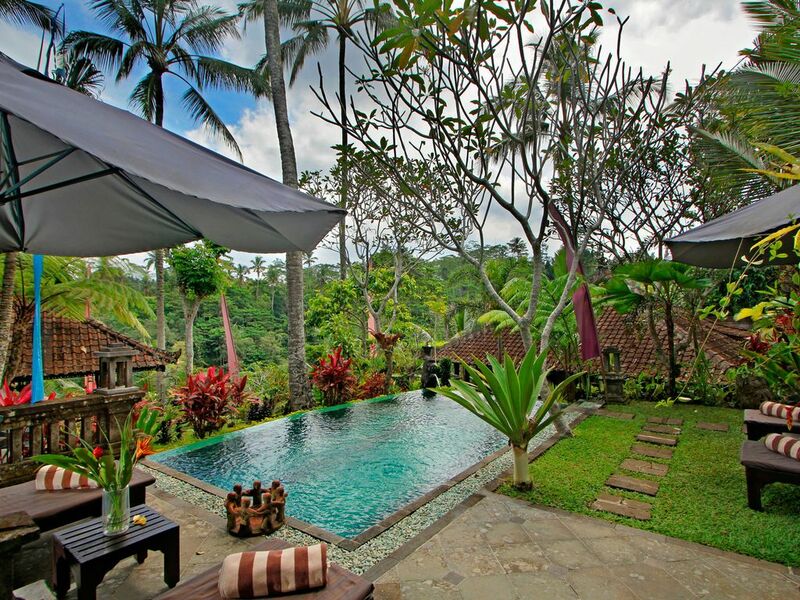 This Private Villa offers you a unique, traditional Bali, and romantic place with a wide valley view surrounding. Enjoy the sound of nature like in the middle of nowhere, green and fresh atmosphere. This is a special place for those who love tropical nature, artistry, value authenticity and seek serenity with style. The Villa is surrounded by some villages, rice paddies, sacred temples, and wood carving arts. You can feel and experience the Balinese local tradition with its culture activities. You are not isolated from real life nor are you wedged within a tourist hotspot. You are close to Ubud's dining, art and culture, real coffee and fine dining when you want it, but far enough away to escape. The sounds you will hear are of authentic village life: the sacred, the industrious, the ebb and flow from sunrise to sunset. Nothing you will see or hear is put on for tourists. It is all genuine. It is 11m x 9m spacious semi open room with glasses that you can look through the green valley view while lying on bed. You can open them during the day time to have more natural fresh air and close them in the night. Bedroom size is 2m x 2m with mosquito net, safe deposit box and wardrobe space in one corner. TV with international channel is available, Tape, DVD, CD Player, and AC. The bathroom with hot and cold water, bath tub and shower. This room is about 7m x 4m wide and slicked by the swimming pool view in the front side of the room. The bedroom size is 2m x 2m with a mosquito net. Room style is semi open door with glasses. It can be opened during the day time and close them in the night adjust to your comfortable moment. This room is also completed with AC, wardrobe space, safe deposit box, tape, CD player, and a mini bar. At bathroom hot and cold water available with a shower. It is a rectangular gazebo with an open air style, where the complete view of the villa can be enjoyed. The best place for relaxing, practicing yoga and mediation, reading books, and cooking class. Breakfast, Lunch and Dinner is also great to serve in this Bale. The small but well-appointed kitchen is where our beautiful staff lovingly prepare a menu of simple but delicious Balinese and Indonesian meals for guests. We offer all meals (breakfast is included in the rate and a menu offers lunch and dinner selections at a modest additional cost). * All bed linens, towels, toilet paper, cooking utensils, basic condiments and drinking water are provided. * Normal household supplies such as toilet paper, soap and other cleaning products are included in the rental price and will be replenished as needed. Located in Sumita - Gianyar, it is about 30 minutes from Ubud and approximately 1,5 hours from Ngurah Rai International Airport. The Villa location is very strategic, because being close to several tourist attractions, such as Kintamani, Tirta Empul, Goa Gajah, etc. For those who would discover Bali can start the trip from The Villa effectively.